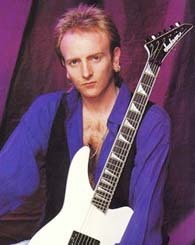 Phil Collen spent the majority of his childhood living in the tough, working-class neighborhood of Hackney, where he gave indications of his future profession as early as the age of three. Most of his free time prior to his teen years was directed towards sports, but the spectacle of a Deep Purple concert attended when he was 14 years old finally brought his interest in music to the fore. Two years later he managed to get his first guitar, whereupon he wholly immersed himself in replicating the performances on his favorite records. It wasn't long before schoolwork became neglected in favor of his musical activities; after dropping out of high school, the young guitarist spent the next several years working a variety a day jobs while struggling to establish himself within the London music scene. By 1977 Collen was playing local clubs with the punk-leaning outfit Lucy, but his personal inclination towards a more technically demanding style of playing eventually had him defecting to the heavy rock-oriented Tush, another London-based act that was working in many of the same venues. This was followed by a brief tenure in the glam-rock band Dumb Blondes, and then three years with the somewhat more successful Girl. It was as a member of Girl that his career began to make significant strides forward, the interest generated by their first album Sheer Greed giving the band a decent showing in the music charts and allowing Collen the opportunity to perform in higher-profile venues; a second album (Wasted Youth) was finally released early in 1982, but by this time both the musicians' and the audience's enthusiasm for their music had depleted itself. The most dramatic shift in Collen's fortunes was to take place in 1982, when he was drafted into Def Leppard as a replacement for founding guitarist Pete Willis -- just in time to appear on the enormous commercial breakthrough Pyromania (1983). Months of intense touring in support of the release (particularly in the U.S.) situated the band to become one of the larger stadium rock acts of the decade, but it would be over three years before this potential was realized, as a series of misfortunes -- ranging from endless production difficulties adding longer and longer delays to the release of the follow-up album, to the more serious circumstance of their drummer Rick Allen's loss of his left arm in a car accident -- put the viability Def Leppard in question. Despite these problems, however, when the next effort Hysteria did at last materialize in 1987, it still managed to surpass its predecessor in sales, as well as providing the British band with their first hit record in their homeland. Def Leppard's inclination towards misfortune carried over into the second half of the decade, and as a result of Steve Clark's substance abuse-related death in 1991 Collen found himself forced to assume all of the guitar duties for the fifth album Adrenalize (1992). For a time the added pressure combined by the loss of a close friend made his future with the band uncertain, although audience support of the band's output once again continued to be strong in the face of such internal difficulties. The dual-guitar format was restored later in '92 when former Dio guitarist Vivian Campbell was enlisted for the Adrenalize tour, and the Collen/Campbell combination has continued ever since, featuring prominently on the albums Retro Active (1993), Slang (1996), Euphoria (1999) and X (2002). In 1994 both Collen and vocalist Joe Elliott took part in a tribute concert for former David Bowie guitarist Mick Ronson, joining Ronson's Ziggy Stardust-era bandmates Trevor Bolder and Woody Woodmansey for a set of 70's Bowie numbers; the four have been intermittently active since under the band name Cybernauts.